The Museum is honored to exhibit this series in recognition of the centennial of the United Synagogue’s founding. At the NMAJH, we love to encourage every visitor to participate in conversations about American history and its intersections with contemporary life, and to add their own personal stories to those that we tell in our exhibitions. In this spirit, we recently added a new feature to the Museum’s free-of-charge first floor that allows our youngest visitors to join in the fun while learning about a historic community leader. Last month, we installed three prints of a portrait of Dr. Solomon Schechter (1847-1915), an esteemed rabbi and lifelong educator, on the Museum’s first floor. Rabbi Schechter’s legendary commitment to learning is commemorated in an international network of educational institutions that bear his name, and he is also remembered for his leading hand in the 1896 rediscovery of the Cairo Geniza. In February 1913, Rabbi Schechter led a group of 22 synagogues in founding United Synagogue, which became a national organization supporting the educational and spiritual life of American Conservative congregations. This year United Synagogue celebrates 100 years of tremendous achievement in enriching synagogue life, youth programming and education, social justice, and environmental activism. In addition to providing a riveting look at a leader of worldwide importance, when shown together, the two artist’s proofs and the final etching of a portrait of Rabbi Schechter by Hermann Struck (1876-1944) provide an exceptional view into the renowned landscape and portrait artist’s process of representing one of American Jewry’s most distinguished leaders. In January 1913 The New York Times characterized Struck, who was then touring American cities to sketch our modern urban landscapes, as “a most striking example of the reconciliation between the new and the old…between modern culture and the oldest ideals and traditions of his ancient Jewish faith.” This pull between tradition and innovation can be seen as the quintessential drama of American Jewish life and it is a story that is repeated throughout the Museum’s galleries. Although he focused on sketching American cityscapes with skyscrapers – which he called a “giant wonderland” – during this trip to the United States, Struck also executed many portraits while he was here. Future community leader Jocelyn Kraut seeks her muse. Near the installation of the etchings, we have added a table where children – and in more than one instance adults – have been busily executing their own portraits and self-portraits after reading about the inspiring leadership example of Rabbi Schechter. Our budding artists are encouraged to bring their work to the Museum’s gift shop so that it can be added to a growing online exhibit that you can view here. An Evening With MLK Jr.
Last summer, I was honored to meet with Edward H. Rosen, one of the Museum’s emeritus Trustees, to accept the donation of a treasured memento of his encounter with the Reverend Dr. Martin Luther King, Jr. In 1965, a few months after he won the Nobel Peace Prize, Dr. King received a Humanitarian Award from Golden Slipper Square Club. As president of that local Jewish charity, Mr. Rosen organized a fund-raising luncheon for the Southern Christian Leadership Conference at the Bellevue Hotel in Philadelphia, and the proceeds and the award were presented to Dr. King that evening along with a small Torah scroll. Speaking at the dinner in his honor, the famed civil rights leader lauded Jewish contributions to the cause. He praised Jewish civil rights workers Andrew Goodman and Michael Schwerner, who were murdered by Ku Klux Klan members during Freedom Summer in 1964 along with their associate James Earl Chaney, an African American man from Mississippi. 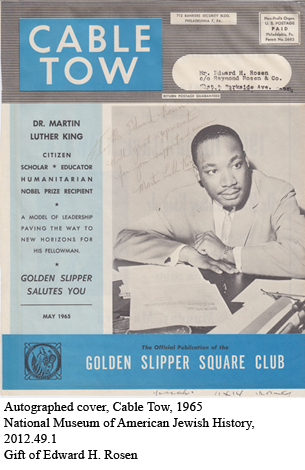 In his message in the issue of the club’s magazine that preceded their meeting, Mr. Rosen urged his fellow Slipper members to “get involved” in the civil rights cause and take action in the shared struggles at hand. He celebrated Dr. King’s courage and his work by saying that “his leadership in the drive for human rights will prove to be a blessing to all people in our country.” While I spoke with him, I could tell that Mr. Rosen cherishes his memory of his encounter with Dr. King and counts it as one of his proudest moments. I am happy that we are able to display this magazine cover, inscribed to Mr. Rosen by Dr. King that night in 1965, in our lobby in honor of Black History Month this February.